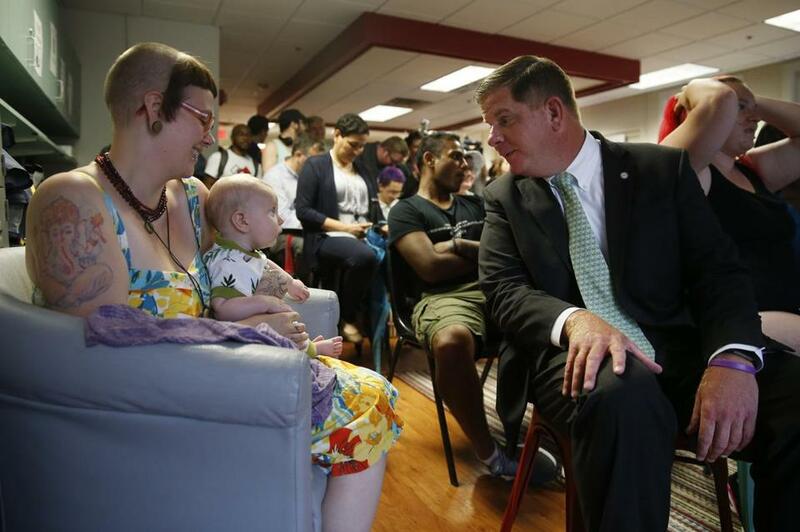 Five-month-old Atlas Arnos (center) charmed Mayor Walsh during a July 2018 event at Bridge Over Troubled Waters, which provides youth homeless services in Boston. Jessica Freeman might be forgiven for feeling a bit out of place in her new home. She had traveled a long road to the house in Dorchester — from homelessness as a teen to a series of crash pads and shelters, to the home in Dorchester she will eventually share with nine roommates. Her new home is called Liberty House, an apartment house that will be formally dedicated on Wednesday. The converted two-family home is an ambitious new project run by Bridge Over Troubled Waters, a social-service agency devoted to helping young people in crisis. Freeman was the first tenant to move in, a few weeks ago. The goal is to give struggling young adults an attractive alternative to shelters or public housing developments, while teaching critical life skills. The residents of the new home will be in their late teens or early 20s, and many will be pursuing some form of higher education. They will pay $250 a month in rent — which will allow them to live independently without overwhelming housing expenses. Teen and young adult homelessness is far more pervasive than most people realize, said Elisabeth Jackson, the executive director of Bridge Over Troubled Waters. She maintains that moving into public housing wouldn’t give her clients the support they need to build thriving lives. Bridge, as it is widely known, works with 2,000 people a year between the ages of 14 to 24. They have fallen into homelessness for a variety of reasons, Jackson said. Some have been kicked out by their families. Many have aged out of the care of the Department of Youth Services, or the oversight of the Department of Children and Families. They are cut loose with no real place to go. Bridge Over Troubled Waters offers a succession of housing programs aimed at helping these young people develop the life skills to find housing and to begin to figure out their futures. The residents of Liberty House will all be alumni of other Bridge housing programs. The idea of establishing a real residence for clients had been a dream of Jackson’s for at least two years. There was just one problem: In Boston’s hot housing market, there wasn’t much a modest nonprofit could afford. For two years, she was outbid repeatedly in her bid to buy a house. Help arrived in the form of one of the agency’s major donors, Liberty Mutual Foundation, the charitable arm of the insurance company. The foundation paid the entire $1.75 million cost of the home, and has paid for new furniture as well. One thing residents won’t have, by design, is much supervision. It’s meant to be a place where they grow up. There’s no one fix to the problem of young adult homelessness. It’s a syndrome with many causes. But Jackson firmly believes that getting people out of traditional shelters and into a more stable environment with like-minded peers is a better way to lay the groundwork for a successful future. Now Bridge Over Troubled Waters — along with its donor — has made a serious investment in that belief. “The system believes just giving them an apartment is fine, but if you don’t build them from within, you’re just putting a roof over their heads,” Jackson said. Freeman, the new tenant, is finishing a two-year degree, and looking to move to a four-year school to study nursing or social work. For her, the new home is just one example of the support from her community at Bridge that has enabled her to thrive.